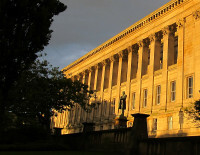 Evening view of St George's Hall from St John's Gardens, with statue of Forwood . 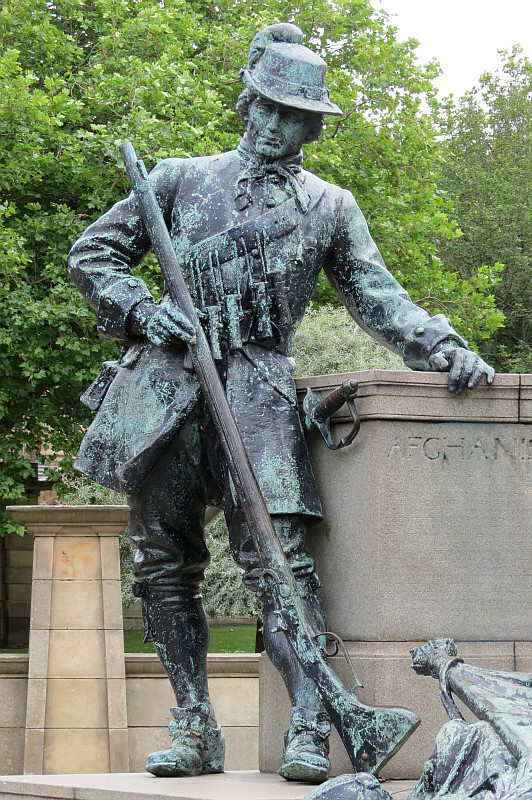 St John’s Gardens, behind St George’s Hall, contains an assemblage of six statues or groups of great men connected with Liverpool and the King’s Liverpool Regiment monument, which includes one of the best known statues in the city. 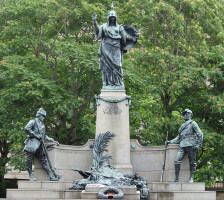 King's Liverpool Regiment Monument . 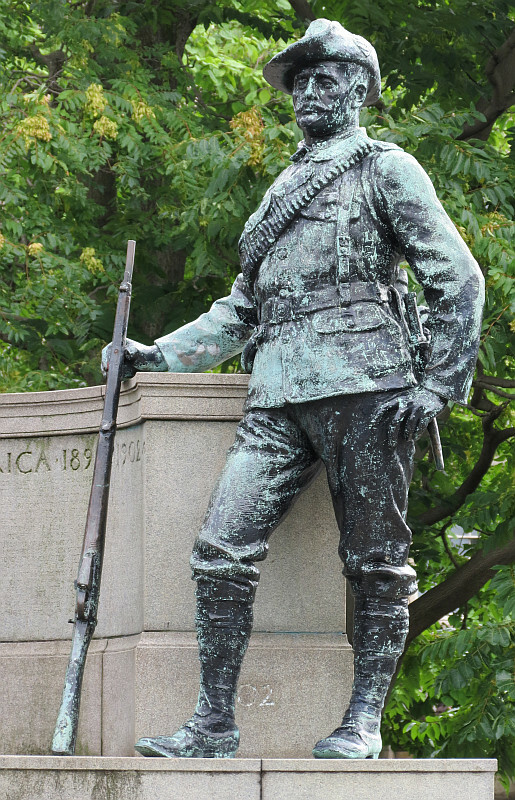 The King’s Liverpool Regiment monument is the centrepiece of the Gardens. 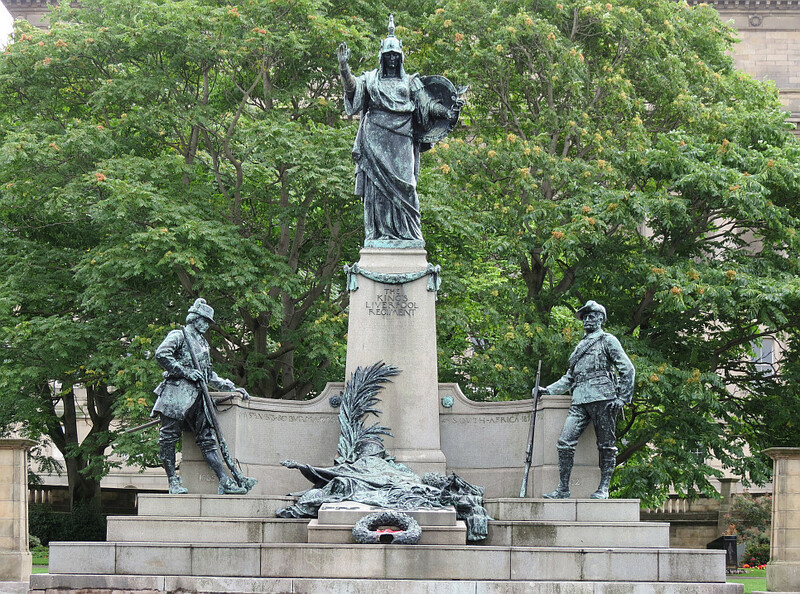 The main frontage of the large Portland stone construction, facing outwards from St George’s Hall, has a bronze statue of Britannia on a plinth, flanking figures of two soldiers representing the Regiment at different periods, and is inscribed on the wall between them with the names of their most recent exploits: Afghanistan (1878-80) and Burma (1885-87), and South Africa (1899-1902). 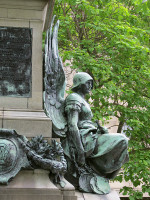 Between them, also in bronze, is a heap of weaponry, flag and a palm leaf, above the several steps to the ground; a wreath is just in front of this, two steps down. 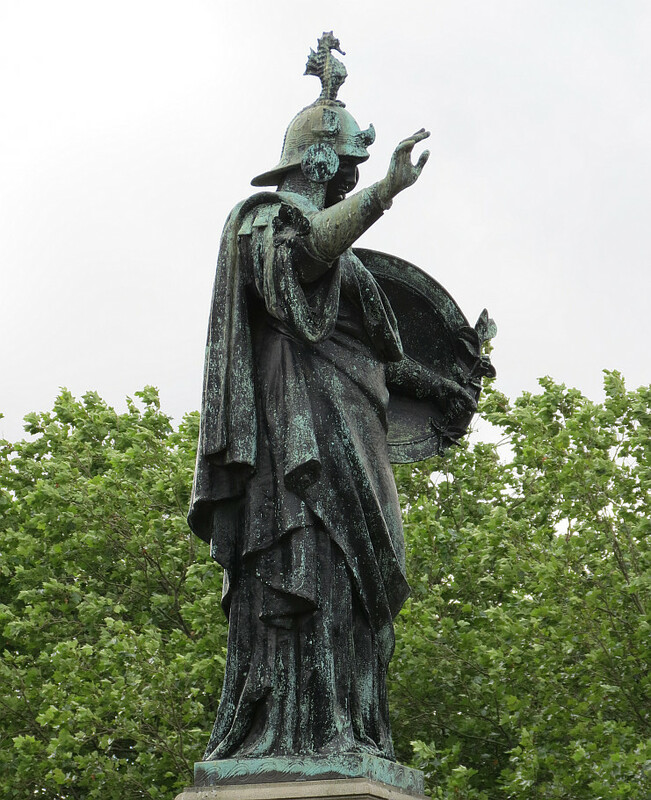 Britannia; right hand view showing the seahorse helm . The soldier to our left as we view the monument represents the typical soldier of the Regiment in 1685, with long gun and some sort of narrow sword behind him, and standing in a lively pose, one foot forward, one hand on the low wall. The other soldier, of 1902, has a rifle and a band of bullets over his chest; he stands more at ease, in what is almost a swaggering lounge. Both rest the butts of their guns on the ground, indicative that the battle is won and peace has been achieved. Goscombe John's Drummer Boy . 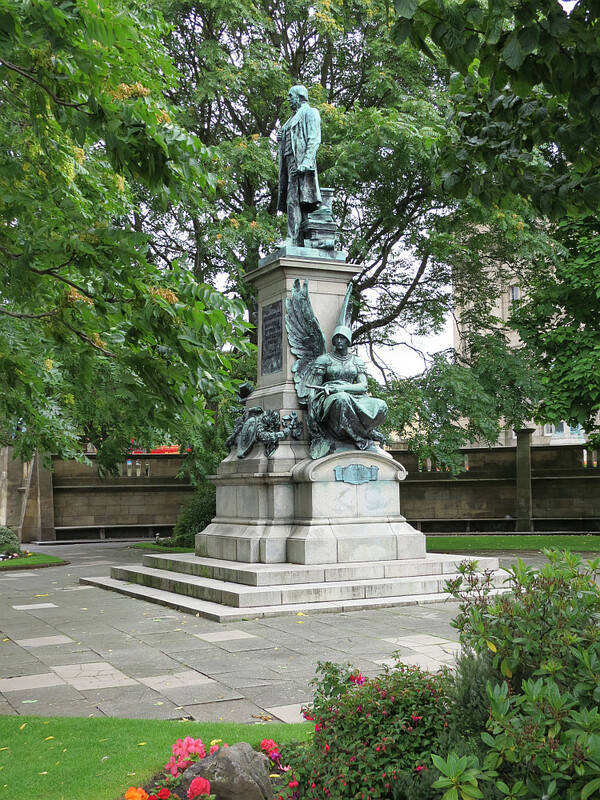 But this is a three-dimensional memorial, and completely hidden from this side, round the back is one of the most famous Liverpool statues, and a figure which alone would give Goscombe John a claim to greatness as a sculptor. It is the Drummer Boy ; a youth seated on a cannon and trophy of flags and so forth, his drum sticks active in his hands, his figure twisted to one side and face serious: a work of immediacy and urgency contrasting with the peacefulness of the other side. The full sized model for this work is on display in the Walker Art Gallery nearby. 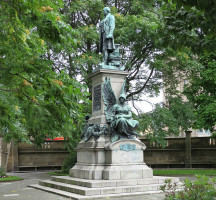 Gladstone monument, by Thomas Brock . 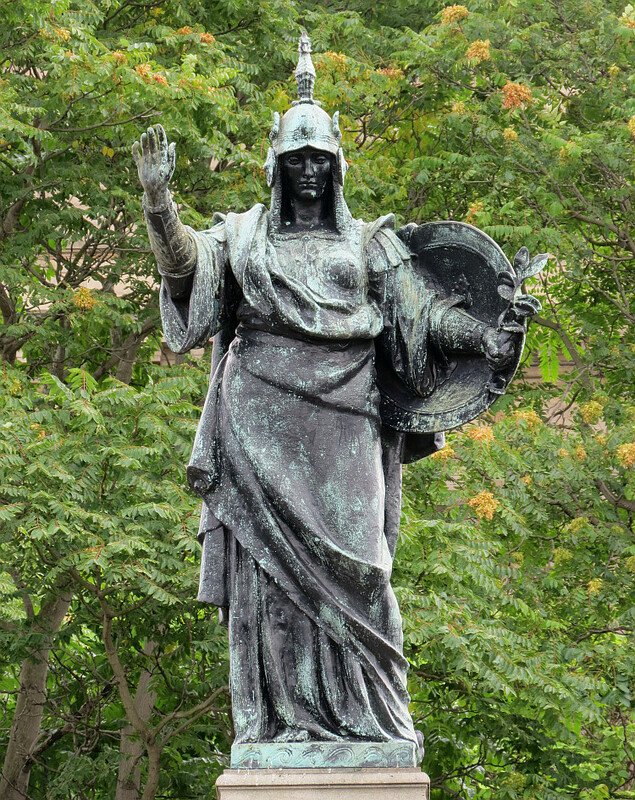 The powerful figure of Goscombe John’s Britannia reminds us (me at least) of the work of Thomas Brock, sculptor of London's Queen Victoria Memorial, and here in St John’s Gardens is his monument to Gladstone , with two allegorical angels accompanying the great statesman, who was born in Liverpool. 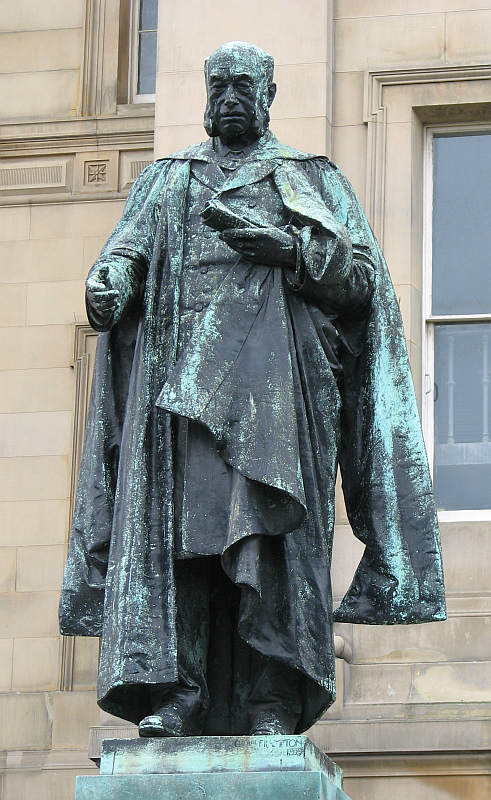 The characteristic figure of Gladstone stands in front of some sort of pediment, with a cloak draped over it. He is dressed in Victorian garb: coat down to the knee over waistcoat and trousers, with no attempt to make him look Classical. He holds in one hand a small bundle of papers, and the other holds the edge of his coat just below the collar. A forceful portrait. We may note that Brock also made the monumental statue of Gladstone for Westminster Abbey, rather similar in pose, but with a long enveloping robe that does make him rather Classical. 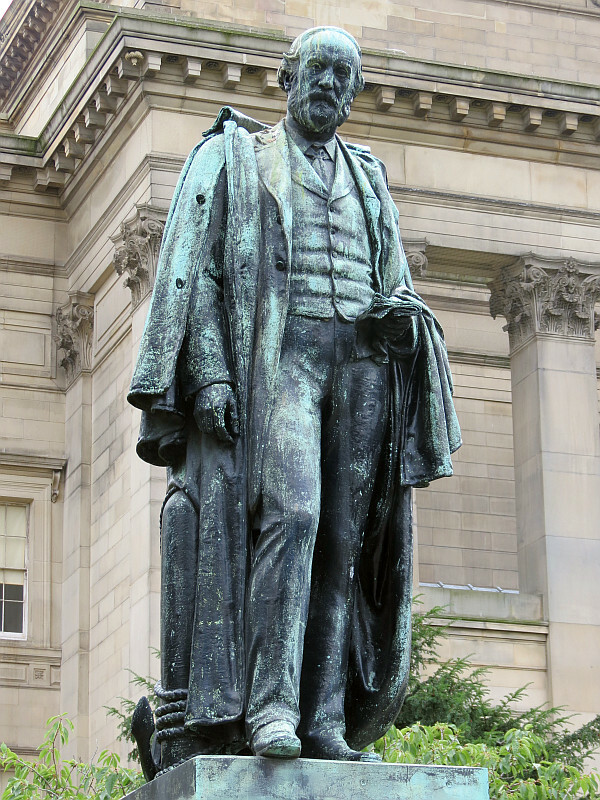 There is in fact another statue of Gladstone here in Liverpool, inside St George’s Hall, by the sculptor Adams Acton. 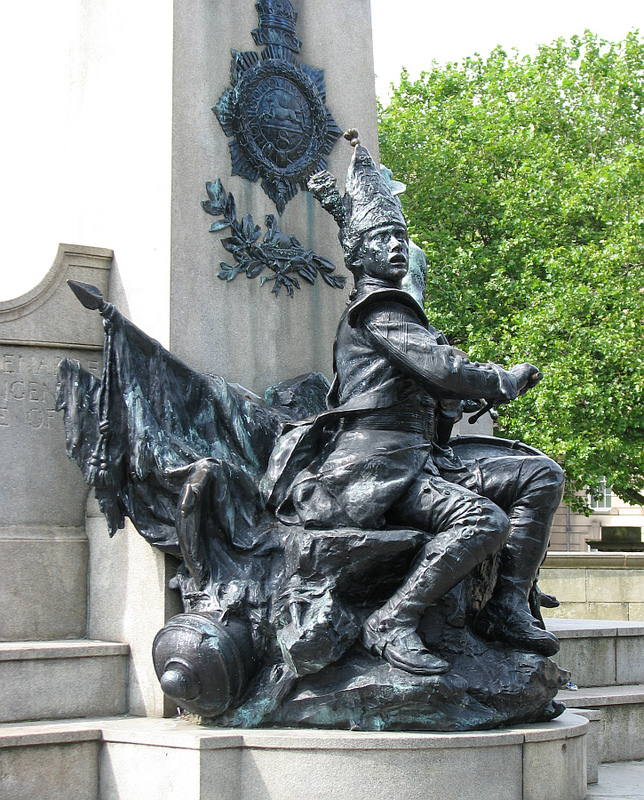 (See the page on the London Gladstone Monument in the Strand for a brief list of other Gladstone statues). Allegorical figures of Truth and Justice . 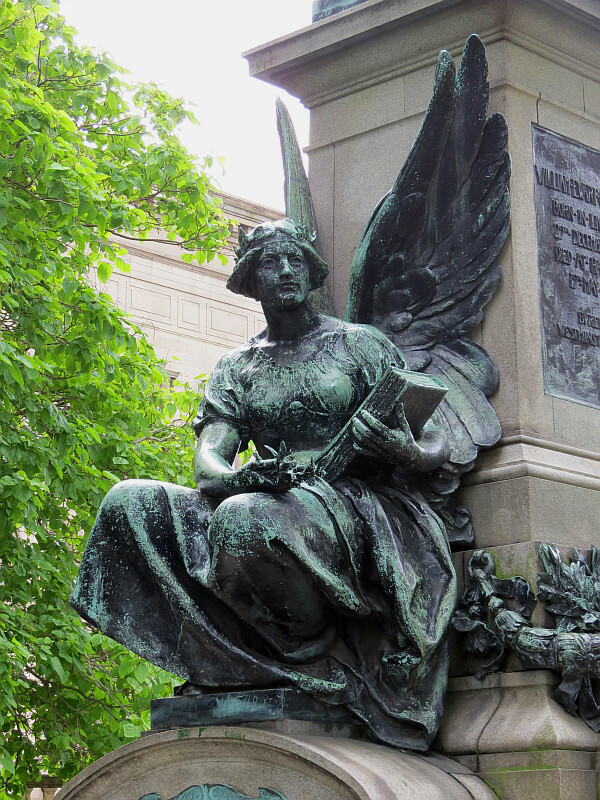 The two allegorical statues seated to the sides of the base of the monument are Angels of Justice and Truth . 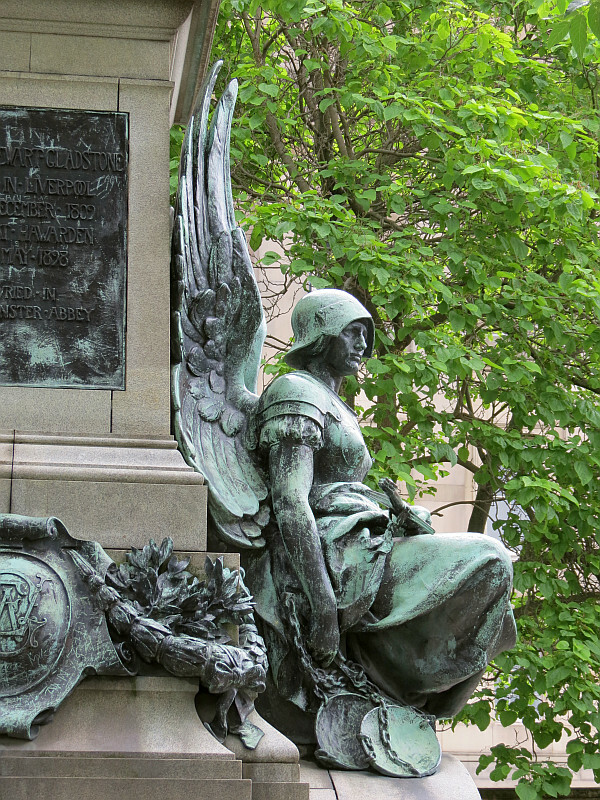 They are both seated, looking outwards and forwards, with wings rising up the sides of the monument plinth as seen from the front. 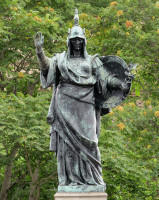 Justice is a splendidly martial figure, armoured and with sword laid across her lap – we see only the hilt, beneath which grips her right hand – and with her scales loosely on the ground, held by her other hand. A powerful figure with serious face, heavy chin and neck, broad chest and muscular arms in the Roman tradition. Truth is equally athletic in build, but wears drapery only, and upon her head, a narrow band with leaves. She cradles a heavy book on her left arm, and holds an olive branch in her right. Very characteristic of Brock, these two, and excellent examples of allegorical figures (for lots more allegorical figures, start from this page; Justice figures in particular are on this page, and figures of Truth are on this one). 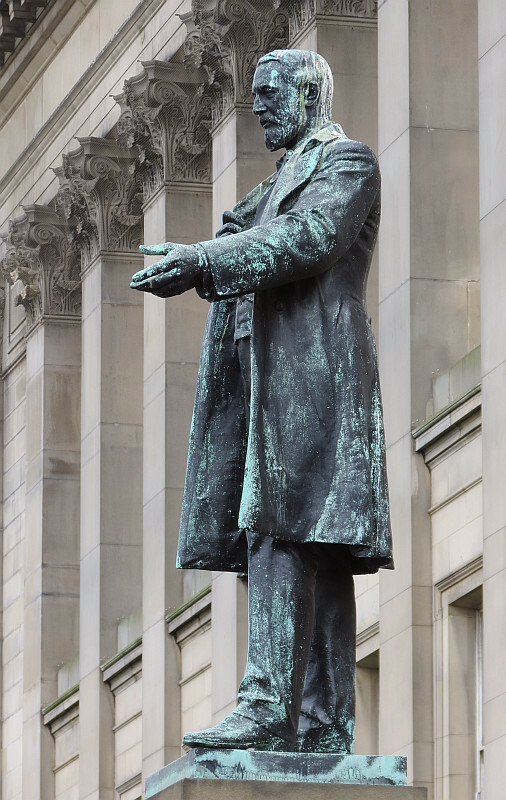 Alexander Balfour , Liverpool shipping magnate and philanthropist, is shown as a magisterial figure standing, or on the point of walking forward, one hand holding papers, the other by his side. He is shown in the combination of modern and ancient attire favoured for many public statues, with his waistcoat, trousers and shoes rather de-emphasised, and his long robes, gathered over one arm, giving him the look of a Roman Senator. His face is Edwardian and sympathetic. 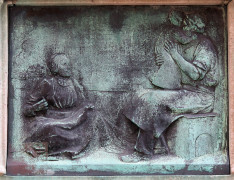 The sculptor was Albert Bruce-Joy, and the date 1889. 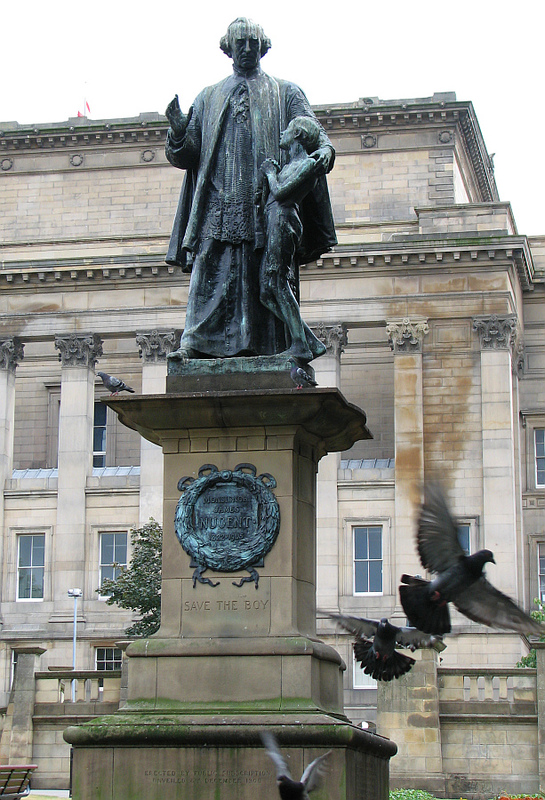 Bruce-Joy has several public statues around the country, most notably two in Albert Square, Manchester, and in Liverpool his work can also be seen in St George’s Hall, wherein is a marble statue of Edward Whitley MP , entirely modern in attire. 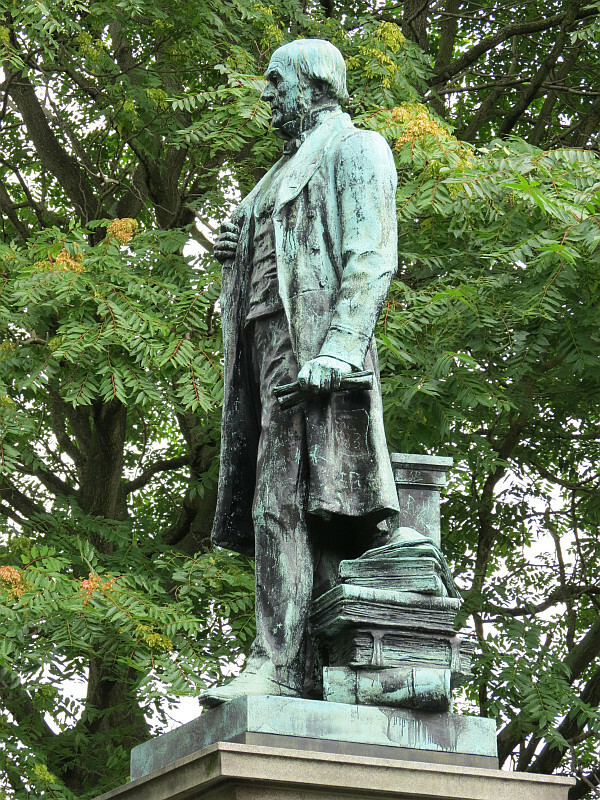 He also has a statue of Gladstone , in Bow, London. Albert Bruce-Joy's figure of Alexander Balfour . 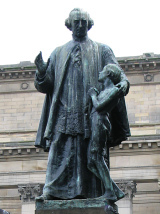 Monsignor Nugent , a priest known for his work with the poor and as founder of the Catholic Times, is shown in clerical garb, rather embroidered around the hem and on the scarf-like ornament on his chest, with one arm protectively round a starveling boy dressed only in torn breeches, and barefoot. A frown of concern is on his face, and his free hand is raised in a soothing gesture; his pose is purposeful and active, with his short robe slightly swirling outwards rather than hanging in repose. This work dates from 1905. 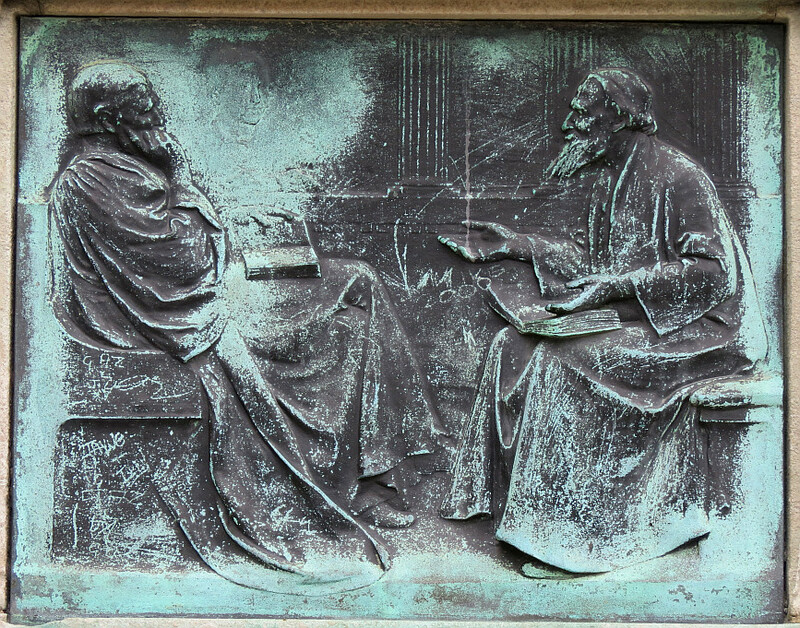 The sculptor, F. W. Pomeroy, was an important figure in the New Sculpture movement, and has many works of public sculpture, including monuments, civic statues such as here, and architectural sculpture, as well as many allegorical works for display indoors. His best known work is the figure of Justice for the Old Bailey. Among his religious works, the lively figure of Dean Hook for Leeds, and the recumbent effigy of Dean Hole for Rochester Cathedral spring to mind, and he has a Gladstone too, which is to be found in the Houses of Parliament. 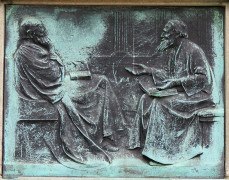 Other examples of Pomeroy’s work in Liverpool can be found just a hundred yards or so away from St John's Gardens, in the ornament and figures on the lampstands in front of the Liverpool Technical College around the side of the group of Museum buildings. Canon Major Lester , who founded various children's charities and educational establishments in the city, is one of three statues in St John’s Gardens by the sculptor George Frampton, another central figure of the New Sculpture movement. 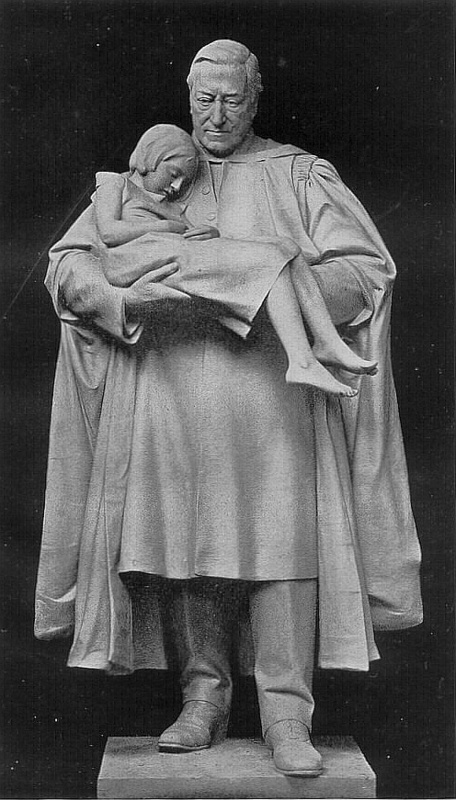 It dates from 1906, and is another portrait of an ecclesiastical personage with a child, this time carrying a sleeping young girl cradled in his arms, making a nice contrast of treatment with the Monsignor Nugent group. He wears a great cloak, and the impression from in front and somewhat below the statue – for the plinth is rather high – is of a harmonious group of hanging folds from this outer garment. A massive and solid statue, much more a figure of repose than Nugent, in harmony with the sleeping girl. 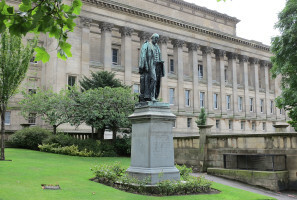 The final two portrait statues, both by Frampton, are up and away on the promenade alongside the long south frontage of St George’s Hall. 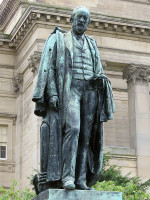 Sir Arthur Bower Forwood MP , the leading Conservative MP in Liverpool, is shown in modern clothing, with rather a bulging waistcoat, in a statesmanlike pose with one hand extended, the other on the collar edge of his knee-length coat rather reminiscent of the Gladstone monument. 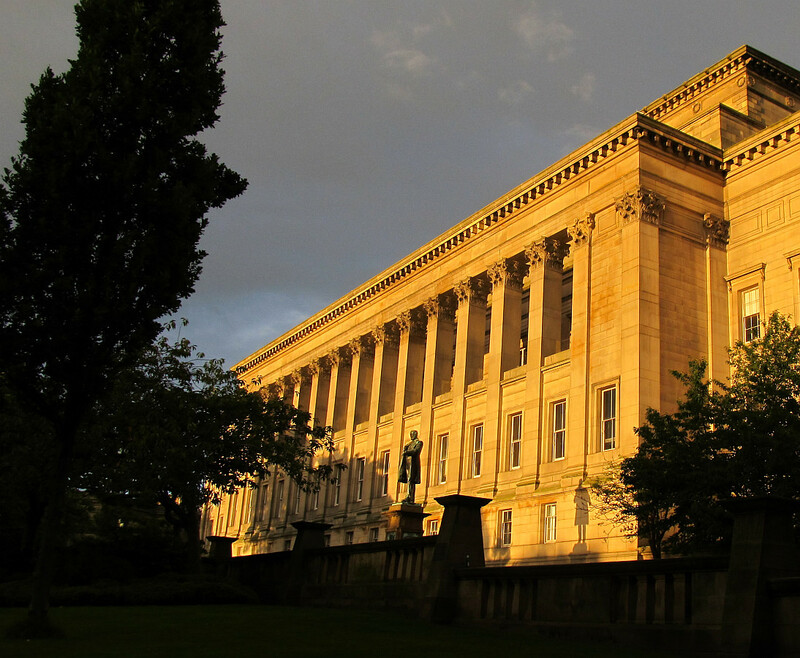 Given its location, it has been made to look particularly good in profile, from either side along the length of St George’s Hall. It dates from 1903. A. B. Forwood, by George Frampton . 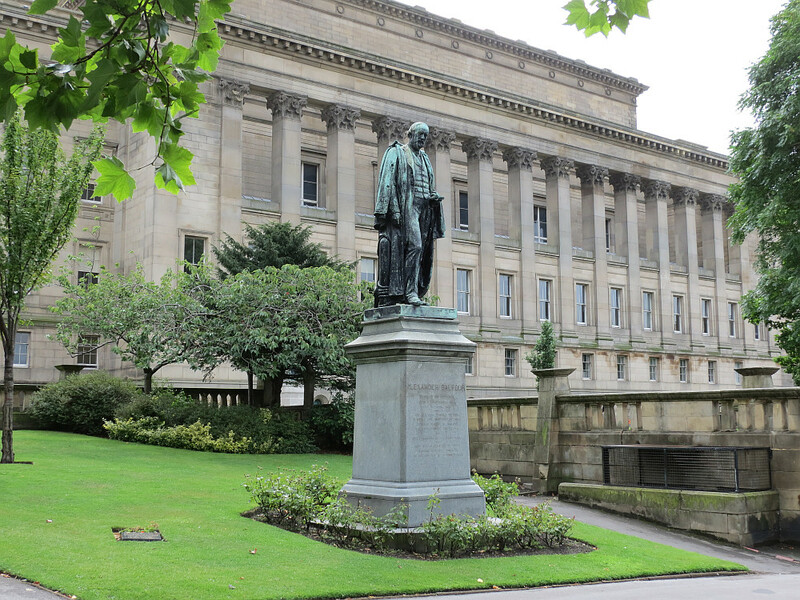 William Rathbone , Liverpool MP and founder of the University (as well as that of Wales) among other good things, is shown with a particularly grand robe, so that we are back in the rather Classical mode, though tending to the Baroque rather than the coolly Hellenic. As with neighbouring statues, he has some roll, or almost scroll, of papers in one hand, leaving the other free for an oratorical gesture. There are three panels in low relief around the base of the statue, showing a hospital scene with a reclining woman, baby and nurses; a family scene of a poor couple with an infant; and a pair of wise Greek philosophers debating, thus indicating Rathbone’s areas of interest and influence. Though painted black and with the black coming off, and much scratched by philistines, these remain interesting works showing the sculptor’s skill in capturing the ordinary pose and nicety of composition. Rathbone statue, and three basal panels . Frampton was an absolutely key figure of the time, and his numerous statues include a great number of ideal and allegorical works, and many public sculptures. 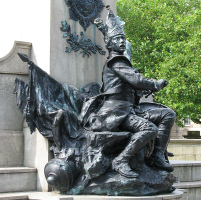 Several of his most important ideal public works are in London – including the Peter Pan in Kensington Gardens and the architectural sculpture for the Lloyds building in Fenchurch Street and some forElectra House in Moorgate. 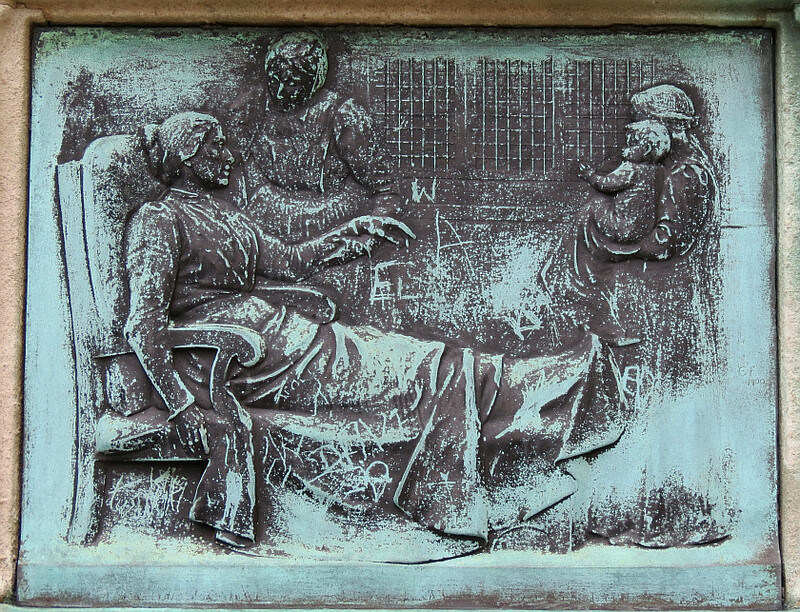 Elsewhere in Liverpool, down by the Docks, is his Alfred Jones Memorial , with characteristic female figures by him representing Research and Enterprise . Modern Road Peace sculpture by Tom Murphy . Although well outside the interests of these pages, we can at least mention the Road Peace memorial to those injured on killed on the road, by the sculptor Tom Murphy, dated 2005. 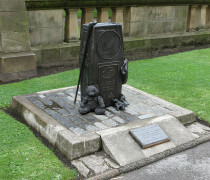 A stubby traffic sign in bronze is accompanied by the paraphernalia of the pedestrian – a stick, handbag, boot, small electrical devices, teddy bear and child’s doll.